182 pages, 5.5" x 8.5"
One of the most highly sought volumes in the library of legendary hand-to-hand combat manuals is finally available from Paladin Press. W.E. 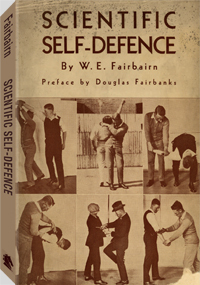 Fairbairn's Scientific Self-Defence, published in 1931 as a slightly modified reprint of Defendu (1926), outlines the brutally effective close-quarters combat program developed during Fairbairn's renowned service with the Shanghai Municipal Police. Fairbairn's straightforward techniques for defending against various holds, dealing with assailants armed with guns or knives, applying truly effective holds and throws, using the club and walking stick for self-defense, and other areas of close-in fighting have had an extraordinary influence on the development of the combat arts. His immense impact on generations of fighting men – from an elite cadre of instructors who trained soldiers in realistic hand-to-hand combat during World War II to today's practitioners of hard-core self-defense – can now be studied directly from the source in this quality reprint edition of Scientific Self-Defence.